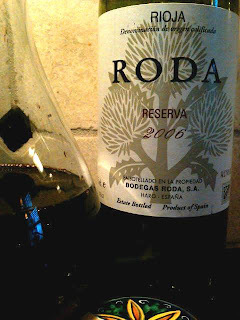 Winethropology: Expensive Rioja - Do You Get What You Pay For? Expensive Rioja - Do You Get What You Pay For? (This wine was received as a press sample.) Spain is awash in terrific values - that's no secret. But what happens when you spend more? Do you get what you pay for? Not that one data point is a trend, but we explore this question with this higher priced (for Spain, anyway) Rioja. Flavors, color, translucence, and aromas faithful to its heritage, this Rioja is deserving (if not demanding) of decanting. Lovely, richly textured, and mid-full bodied. Framed with enough oak and acids to make this a versatile food wine. At $45 it's at the upper spectrum for Rioja, but is still a very inexpensive means of transporting northern Spain to your table. The unmistakable comfort of oak cloaks this wine in an obvious, but unobtrusive way. The balance can't be overlooked and the smile on your face is proof of that. Worth the $45 price tag? That's a tough one. But a one time splurge across the ocean certainly can't hurt to get the answer.